WILLIAMSPORT, Pa. - The bye week may have come at the perfect time for the Lycoming College football team, as it will come back refreshed on Saturday, Oct. 17, when it heads to McCarthy Stadium for a 1 p.m. Middle Atlantic Conference matchup with King's. The Warriors (1-4 overall, 1-3 MAC) are coming off a heartbreaking 41-38 overtime loss to Lebanon Valley on Oct. 3. Lycoming came back from an eight-point deficit midway through the fourth quarter to force overtime, but Lebanon Valley rallied with an overtime touchdown to win it. The Monarchs (1-4 overall, 1-3 MAC) are coming off a 13-7 loss at Stevenson on Oct. 3. • With 3,099 career all-purpose yards, senior Ryan Umpleby needs 95 more to move from 10th to sixth in school history. • Umpleby needs 49 more receiving yards to become the fifth player in school history to post 2,000 in a career. • Junior Blake Bowman is tied for the MAC lead with five rushing touchdowns. • Bowman needs 45 more rushing yards to become the 23rd player in school to reach 1,000 in a career. • The Warriors have scored three defensive touchdowns this year, the most for the team since the 2011 team also had three. • Senior Matt Malecki needs 10 more tackles to reach 150 in his career. • Junior Chase Whiteman leads the MAC with an average of 7.37 yards per pass attempt. • Junior Jon Rummel has been in on a sack in four of the five games this year. Lycoming is fourth in the MAC in scoring offense (24.6), fifth in total offense (354.4), third in rushing offense (171.6) and fifth in passing offense (182.8). Junior quarterback Chase Whiteman leads the MAC with an average of 7.37 yards per pass attempt and he is third in passing efficiency (120.2). He has thrown for five touchdowns, which is fifth in the league. Junior running back Blake Bowman is fourth in the MAC with 86.1 yards per game and he is tied for the league lead with five touchdowns.Senior Ryan Umpleby and senior Pat Whalen are both in the top 10 in the league in receiving, with Umpleby fourth at 62.0 yards per game and Whalen seventh at 61.8. Lycoming is ninth in the MAC in scoring defense (32.6), fifth in total defense (381.2), fourth in rushing defense (125.4) and 10th in passing defense (255.8). Junior Jon Rummel is sixth in the league with an average of 0.80 sacks per game to lead the team at the line. Both Rummel and senior Josh Cook are tied for the team lead with 6.0 tackles for loss, while Cook is second on the squad with 2.5 sacks. In the secondary, sophomore Mike Ward is third the MAC with 1.6 passes defended per game and he is eighth with 0.4 interceptions. Senior cornerback Matt Malecki leads the team with 32 tackles. King's is eighth in the MAC in scoring offense (17.8), 10th in total offense (249.6), ninth in rushing offense (90.4) and seventh in passing offense (159.2). Senior quarterback Tom Hehre is sixth in the league in passing yards per game at 148.5, seventh with four rushing touchdowns and fourth with a .550 completion percentage. The wide receiving pair of junior Mike Palmer and sophomore Matt Demarco are each in the top 10 in the MAC in receptions per game. Palmer is eighth in the league at 4.8 receptions per game, as he leads the team with 260 yards and two touchdowns. Demarco is ninth at 4.6, as he has 19 catches for 138 yards. King's is sixth in the MAC in scoring defense (26.2), seventh in total defense (392.0), eighth in rushing defense (204.0) and sixth in passing defense (188.0). Senior defensive end Michael Martina paces the team, as he leads the squad with 33 tackles, 7.5 for loss, and his six sacks are second in the MAC. Senior Jacke Manetti (32) and sophomore Anthony Martuccio (31) are second and third on the team, respectively, in tackles out of the safety position. Manetti also has an interception and two breakups. While the Lycoming defense has pitched 66 shutouts during assistant head coach Steve Wiser's tenure with the program, the 2015 defense has been just as prone to put points on the board itself. Through five games, the defense has accounted for three touchdowns. Against Wilkes, Lycoming scored twice, with junior Zach Smith falling on a fumble in the endzone and junior Tyler Smith returning an interception 14 yards for another score. Freshman Wyatt Entz added the third score at Lebanon Valley, as he recovered a fumble and rolled 47 yards for a score. This is the first time since 2011 that Lycoming has scored three touchdowns on defense and it is third in the Division III in the category. Senior Ryan Umpleby continues to rise in the school's career record books. The Forest Hill, Md., native needs 49 more receiving yards to become the fifth receiver in school history to notch 2,000 in a career. His 133 career receptions are already fourth in school history and he is one touchdown away from the top five in receiving touchdowns, as he has found the endzone 17 times in his career. He is also just 126 yards away from third place in career kick return yards, where Ricky Lanetti (2000-03) sits with 987. When senior Ryan Umpleby broke away from the pack for an 89-yard kickoff return touchdown near the end of the first quarter against Lebanon Valley, it marked the first time in six years and just the sixth time in school history that a Warrior returned a kickoff to the endzone. The last time a Warrior returned a kick for a touchdown was in 2009, when Parker Showers found the endzone in the season opener against Bridgewater. Head coach Mike Clark will look for his 50th career win on Saturday when the Warriors visit King's. In his eighth year as head coach, Clark has led the team to six winning seasons, including five in a row from 2010-14. Clark's Warriors have won eight games three times and won MAC titles in 2008 and 2013. 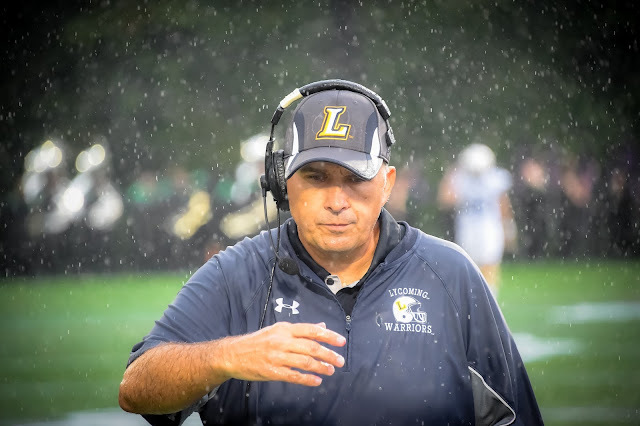 Despite being the fourth-longest tenured head coach in Lycoming's 114-year history of football, he is second in all-time wins, behind only Frank Girardi, who won 257 games from 1972-07. Junior Blake Bowman has notched more than 100 all-purpose yards in four of the Warriors' five games this year. The running back has two 100-yard rushing games, while his efforts in receiving (6 catches, 68 yards) and kick returning (8 returns, 183 yards) have also contributed to the 100-yard efforts.